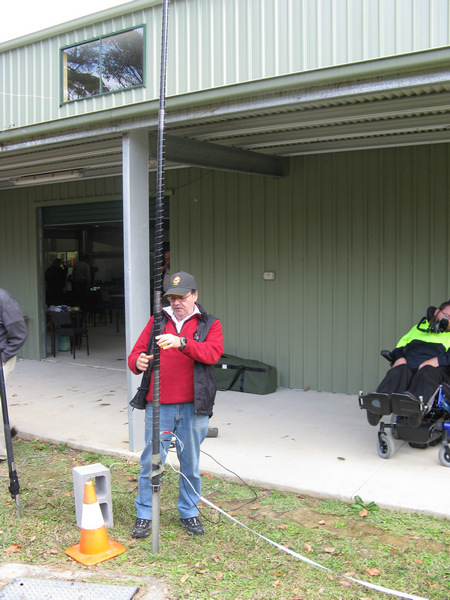 On Sunday, April 29th, WICEN NSW held an informal information day and BBQ at the ARNSW site in Dural. While originally planned to be held at Ingar Creek campsite near Wentworth Falls in the Blue Mountains, an adverse weather warning during the preceding week forced the change of venue. 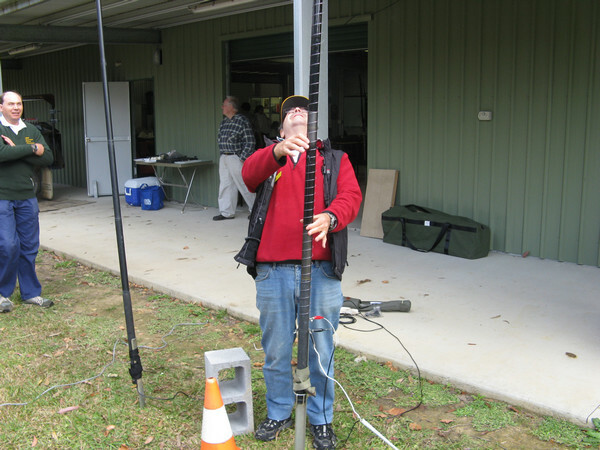 One of the attractions of the day was the opportunity to show off portable antennas. Below is a description of two antenna systems displayed on the day. The following is a description of a Vertical HF Antenna made from a 7 metre squid pole, a couple of metal slinky toys, and a 5 metre tape measure. I also bought their pole holder. Then I bought a couple of mini metal slinky toys from eBay. You can also use one or two standard sized one (Height: 6 cm Width: 8 cm Depth: 8 cm). To form a hook at each end I used a "utilux" automotive crimped terminal at each end.I also used the same method to connect two Slinkys together. I also prepared a 3 metre length of RG-58 with alligator clips at one end, and PL-259 at the other. I used a red alligator clip to connect to the inner conductor and black to the braid. Ladder line with a 4:1 balun would probably work better. I use the 5 metre measuring tape as a counterpoise, attaching the tape to the pole holder with a bit of wire, again with an alligator clip. First The pole holder is hammered into the ground to provide a stable base. Then I simply connect the the slinky toy to the thin (top) end of the squid pole with a looped cable tie arrangement. and used another cable tie at the bottom to hold it to the pole holder, making sure the Slinky doesn't touch the pole holder, which is used as part of the ground system. I then clip the feed line RG-58, red side to the slinky, black side to the pole holder. I also clip the tape measure to the pole holder and extend then tape measure to it's full length along the ground. The antenna doesn't resonate on any ham band, but it's close on 40 metres, depending on how far the Slinkys are stretched. I simply use an LDG HF autotuner which makes it very frequency agile from 80 metres through 10 metres. Theoretically, the more counterpoises you put on the better, especially if they are elevated, but It seems to work well whatever I do. 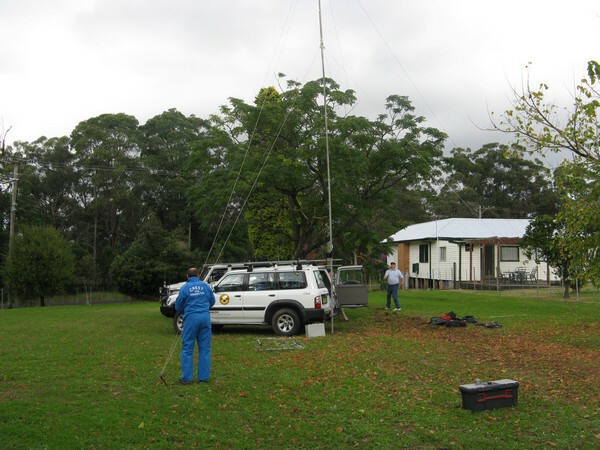 The mast is used by CREST NSW for our portable repeater and is reasonably simple. There are 2 sections of 4 metres and guy points at the middle and top. This gives it a height of a little over 8 metres . There are three guy ropes at each point. The two tube sections used are 48 mm overall diameter with a 1.5 mm wall thickness. They are T6 temper extrusions. Short pieces of 44 mm OD tube are used as sleeves to join the pieces at the centre and as a support for antenna at the top. Both tubes are the same and are interchangeable. The base of the mast is made of two steel plates that form a cross. A simple U bracket is bolted to this and a piece of 44 mm OD tube to make a swivelling pivot or universal joint. The base is held in place by four large tent pegs. Three short, 450 mm, star pickets are used to anchor the guys and two shackles on each star picket used to secure the guy ropes which are low stretch 4.0 mm dia cord. The guy ropes attach to a triangular plate that slides over the 44 mm sleeves but not the 48 mm tubes. The whole assembly can be erected in about 20 minutes by one person. 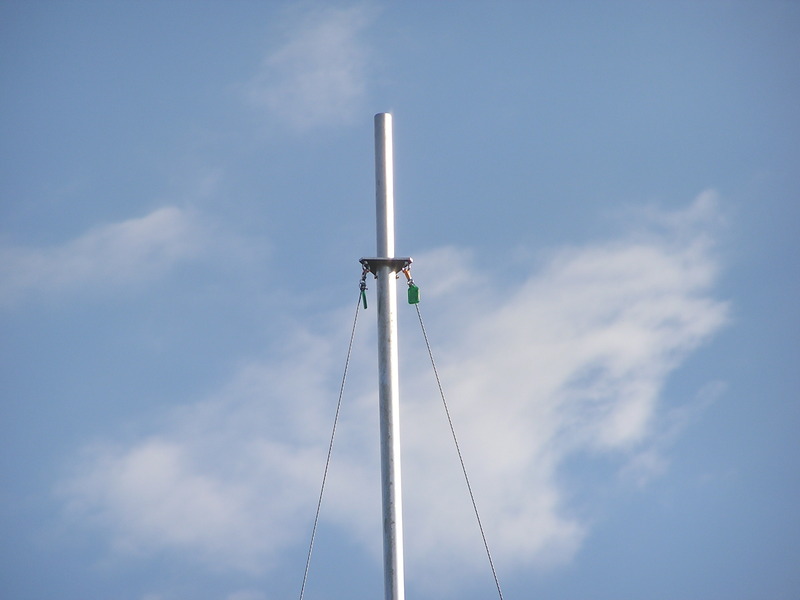 To erect the mast select a position with enough clearance to be able to lay the equipment, including the antenna, on the ground. Open the base and securely peg it in place. Set the star pickets on a 3 metre radius and at 120 degrees to each other. (Suggest have a cord cut to 3 metres as a measure to simplify this task). The mast should be laid out midway between two of the star pickets. Slide the bottom section onto the tube attached to the base. Fit the lower set of guys and lay out. Slide the top section onto the tube protruding above the guy point. Fit the upper set of guys and lay out. Attach the antenna and coax. Secure the coax to the tubes with suitable ties or tape. Ensure that the guy ropes are free and clear of the coax. Two of the lower guys can be attached to the lower shackles on the star pickets closest to the mast. The guys should be tied 5 metres from the top. (Again to simplify this measurement there is a marker one metre from the base of the tubes). A truckies hitch helps to tension the guys, preferably made with a figure “8” on the bight. The guy then goes through the shackle, the through the loop formed by the knot and back through the shackle. It can be secured with two half hitches. As the tubes are light the whole section may now be raised to the vertical position. The third guy can be tied off on the lower shackle. Now erected one must spend a little time adjusting the guys to ensure the mast is vertical. The top guys may now be tightened. 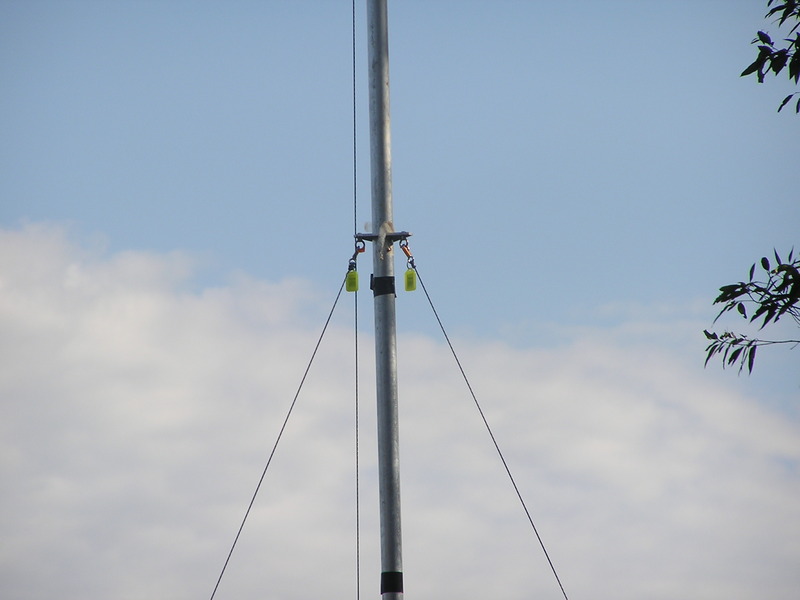 Now the erection is completed and the repeater may now be set to work. 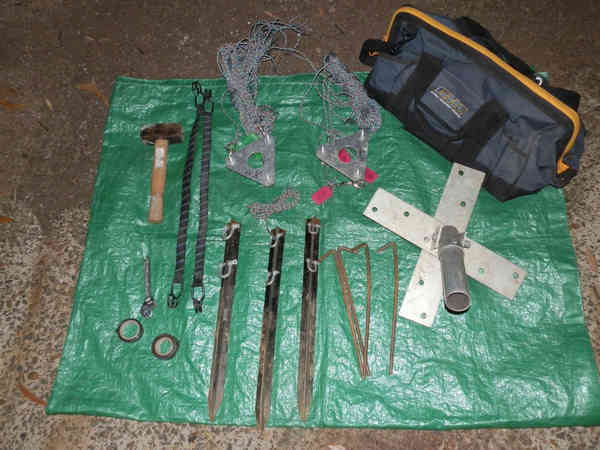 The CREST mast: The Accessory kit showing the base and tube assembly, base and guy pegs, guy ropes and mounting plates, 3 metre measure, hammer, spanner, tapes and ocky straps to hold the tubes on the roof rack. These all fit into the GMC tool bag. 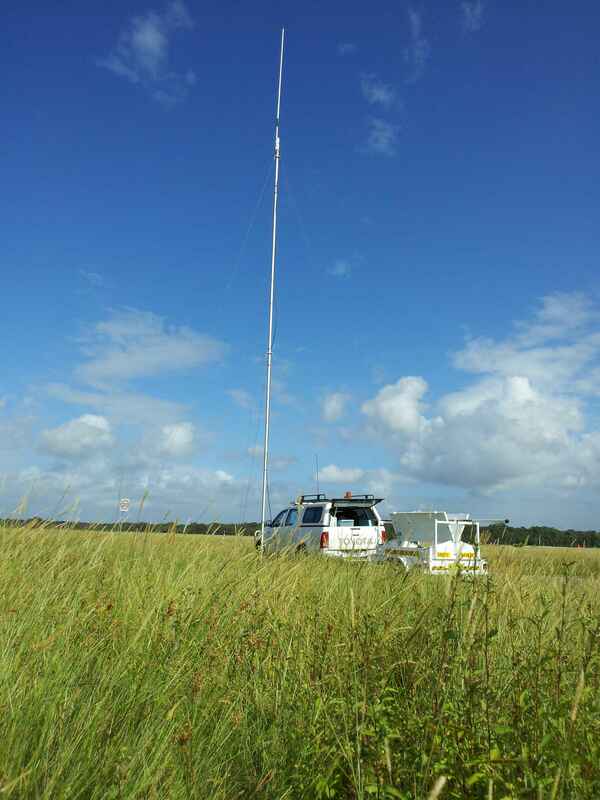 The CREST mast: The mast in the field with a VHF co-linear antenna.